Found this photo I had from last year, from my old flat. I was just at home in the living room, and to start with I thought this was a joke rubber insect put there by my then housemate Joshua our radio announcer and journalist from Bridges for Peace. 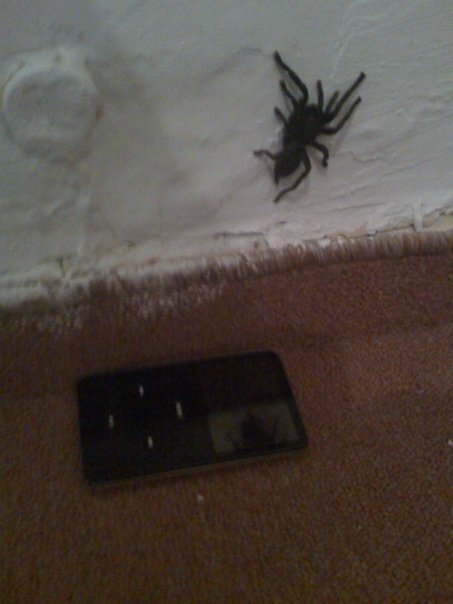 I decided to put my (30gb hard disk model) iPod there to gauge its epic arachnid awesomeness. This is here not for Halloween which I disagree with, not just for its questionable Pagan connections, but that its a dumb idea to send kids to knock on doors on total strangers, but actually I actually like spiders, they eat flies and bugs that spread germs and diseases like Malaria, build (but I think only the smaller ones) webs to make their prey in a clever structure, fabricated from a super strong material they make which is completely unmatched by anything man-made today. I dont think this one was a tarrantula, as its black and not brown. As its about 4 inches long and its legs are so big and hairy, you can hear a tick-tick-tick noise as he walks up the door frame.